So here we are, the rest of my Saturday gaming with friends. After our Saturday morning emotions with ‘A Penny for my Thoughts’, I decided to opt for a game of Ribbon Drive with Dave, Jess and Ash. This is currently one of my favourite games, basically about a road trip. You play a group of friends/acquaintances/family members taking a road trip together. The game uses music to set it up and drive it. You pick a play list (usually created by one of the players) and use the first two tracks to set up the journey and your characters. Our playlist was created by Dave and the first track was – ‘Sweet Dreams are Made of This’ by The Eurythmics. From this came the idea that we would be on a road trip trying to escape the clubbing drug culture that our characters were part of. As we developed our ideas it changed slightly to the fact that another of our group had died whilst taking their first Ecstasy Tab and we were taking the road trip they’d always wanted with their ashes. The second track, which is used to help develop the characters, was Zombie by The Cranberries – always a powerful track, and tied in with the former made for some interesting ideas. We ended up with four characters – Ally (Ash) the older sister of Ella/Elf who died. Ally had a drug problem and blamed herself for her sister’s death. It also turned out she’d stolen the ashes from her mum’s house for the road trip. Clara (Jess), Ally’s best friend, these two were the oldest members of the group. Clara was pregnant and didn’t know what to do, or who the father was. Mikey (Dave), the youngest member of the group, and Ella’s boyfriend. Probably less involved in the scene that the others, and just there for Ella. Had some decisions to make about his future. John ‘Coop’ Cooper (me) – a couple of years younger than Clara and Ally, but from the same school. Had been in the army but left under circumstances no-one else was aware of at the beginning of the game. Incredibly loyal, somewhat twitchy, and a follower, more than happy to let other people be making the decisions. In Ribbon Drive each character has 2 futures – formed as questions, The ‘no; answer should mean continuing their life as it is, with the ‘yes’ answer meaning making significant changes. Coop’s 2 futures were – ‘Will I tell the others why I really left the military?’ and ‘Will I take some responsibility for myself and others?’. I can’t fully recall everyone else’s futures completely, one of Mikey’s was about taking an apprenticeship back where we started, Clara’s were around a decision on the pregnancy and changing her life around, and Ally’s about dealing with her guilt and addiction. This game was amazing, with some emotional highs, and some real low moments. Once again I had tears on a couple of occasions. At one point my character took over the driving, having taken an illegal pick me up. When Clara discovered this, he was made to pull over and switch with someone else. At a rest stop a short while later Mikey confronted him about this, and Coop finally opened up. He admitted he had been court martialled and discharged from the army after a training accident in which he crashed the jeep he was driving and killed 3 squad mates, all whilst still suffering after a night on too many drugs. This gave raise to Mickey uttering the line of the game ‘I’d hit you if I thought it would do any good’. However it wasn’t this that particularly hit me, it was the later conversation with Clara (both Clara and Ally missed the earlier reveal – both as players and characters). Clara and Coop were in the back seat talking, and Coop started to apologise for driving whilst using earlier, and talk about how stupid it was. This led to the above confession again – this time to Clara. The bit that got me, and brought the tears, was when there was a moments silence, and then Clara said something (I don’t recall exactly what) but called Coop ‘John’ rather than Coop. This was the first time his first name had been used all game, and just seemed to drive home how heavy it all was. Again this was an amazing game, and has to have been one of the best games of Ribbon Drive I’ve ever played. Thanks to Ash, Dave and Jess for giving me one of my favourite gaming experiences in a table-top (ish) game. Definitely one of my top 2 experiences of the year so far – although it’s only March, so plenty of time to up it. 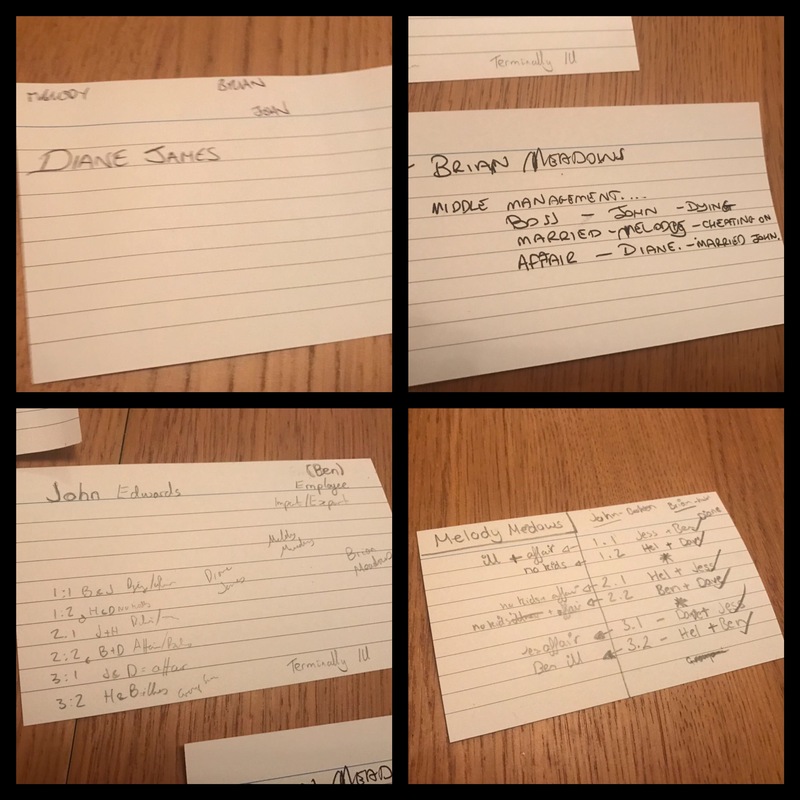 In the evening, because I’d not had enough feels, I decided to play A Family Affair (Deconstructed) with Dave, Jess and Helen, with Ash facilitating/spectating. Family Affair is a game written by Ash, that has a very strict structure and story (in its normal mode), you know what secrets will be revealed each scene, and that a certain person will die at the end, this is very liberating and allows you to concentrate fully on the scene at hand. I always enjoy this game, but have been particularly enjoying the deconstructed version – in this version the relationship web is set up randomly and then you build on it before actually starting. This is my other favourite game of the year so far. Me – John Edwards, married to Diane, employed by Brian and brother to Melody, diagnosed with a terminal illness (unnamed) and as only himself and Brian know this. Having spoken to Ash since the game some of this would need tweaking before being played again, as Brian knew too much and it basicallymeant he was a complete cad, with no way out. Having said that though again this was an amazing game. My first scene was with Jess, and having to tell her about my terminal illness, just as she told me about Brian and Diane’s ‘affair’. Whilst a very powerful scene it did set up the whole game as us against the others, as we were both very much the wronged parties in the whole thing. This led to our scenes with the other being very aggressive or at least passive aggressive. I tried to down play this a bit as I felt it fit the character, but the Diane and Brian characters were very much cast as the villains of the piece. However for me the killer scenes were having to tell Diane I was dying and then the final graveyard scene, where although terminally ill, I was still alive, and myself, Melody and Brian were at Diane’s graveside – with her having died in an accident. This is probably because although Helen and I game together quite a lot, its actually quite rare that we play a couple, especially in a game as emotionally charged as this one. Telling my real life partner that I was terminally ill, and they were the last person I was telling, was incredibly tough emotionally. Yes of course it’s make believe but personally to play my characters effectively I start to inhabit them somewhat – and even imagining that conversation with Helen is incredibly difficult. The final scene at the graveyard was even more so, again I know it’s an RPG and not real, but imagining being at Helen’s graveside was not easy. Both of these scenes got me crying – again. All that said though it made for a great game, I particularly enjoyed my scenes with Helen and Jess – no offence to Dave, but the set-up really didn’t help him. I believe that Ash is looking at making this a playset of A Family Affair with some tweaks to make the set up more balanced, if this happens I will definitely play it again, although possibly not with Helen and myself being Diane and John – for all the impact it being the two of us had on us and the others, I wouldn’t want to do that too often. So all in all I had superb games over the Saturday – giving me everything I hoped for. It is definitely the first time every game I’ve played in a day has brought on the tears, but I knew it was a possibility going into those games – and its only fair to say I chose games that had the potential to hit me in the feels. One of the best things of the whole weekend for me was the people. We hit some hard subjects over the whole weekend, but for me it was one of the safest spaces I’ve ever been in, and although we always have lines and veils conversations with those particular people there’s nothing I’d feel unsafe with – although there will always be topics I won’t game about.